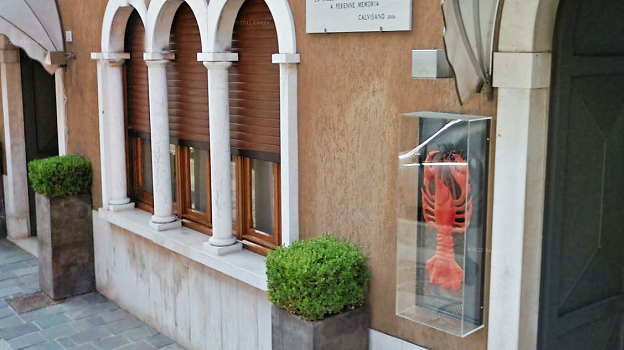 Al Gambero is widely regarded as one of Italy’s best country restaurants. The Gavazzi family has run Al Gambero with flair and substance for four generations. Antonio Gavazzi oversees the front of the house, while his mother Edvige and wife Paola (wo)man the stoves. A one Michelin star restaurant (but for my money, much closer to two stars than one in merit), the Gambero is the place to enjoy great, traditional Italian cooking. No bells and whistles: just first rate ingredients and a quiet mastery in both their cooking and delivery to the table. The wine list is both interesting and personal, with many great and fairly priced wines to choose from. There wasn’t a single glitch on this night. The antipasto of culaccia was incredibly silky; the spicy mostarda precise in its candied fruit and mustardy flavors, without being so hot that one is left unable to taste anything afterwards. Culaccia is a salume very similar to culatello: just like prosciutto, both are made from the pork’s thigh, but culaccia and culatello have no bone. The main difference between culaccia and culatello is that the former has the pork rind left on as protection from excessive drying as it matures in a less humid part of the pianura padana. In any case, both are heavenly suave and moist, and represent the Rolls Royce of salumi). The snails and potato cream were heavenly: so good in fact that I gobbled mine up much faster than proper dining etiquette probably warranted! The sweet, plump flesh of the fresh, tasty prawns, known here as mazzancolle, was wonderfully intense and lifted by the light but perfumed Garda olive oil. These really tasted as if the critters had stopped swimming only minutes before! Readers might like to know a little more about mazzancolle (Penaeus kerathusus) a wonderful crustacean typical of the western Mediterranean sea as they are often confused with shrimp, if for no other reason that mazzancolle don’t live in North American waters. Mazzancolle (Mediterranean striped prawn, in English) are generally bigger than most shrimp – they can easily reach 20-22 cm (especially the females) – and are unrelated to them as well as to scampi. The latter are known as Norwegain lobsters (Nephrops norvegicus) or langoustines in French, and therefore characterized by pincers or claws, which mazzancolle do not have. Clearly, knowing all this would be moot if mazzancolle weren’t so heavenly and worth a detour any time you find them on a menu. Matching just one wine to all these starter dishes was hard work, so I opted for something fresh but with body, age and depth. The 2007 Tramin Pinot Grigio Unterebner is probably Italy’s best or second best oak aged Pinot Grigio, and as this bottle attests, it can age well. The 2007 is still a little dominated by its toasty, caramelly oak, but the racy, delicate Pinot Grigio aromas and flavors of ripe yellow apple and pear are not drowned out by vanilla or sweet oaky spices. Considering that many of the world’s Pinot Grigio bottlings (not just Italian) are mainly shameful trials at turning wine into water, the Unterebner offers serious wine lovers a glimpse of what passionate and talented Italian producers can achieve with this noble variety. I didn’t think I could possibly have a better risotto than the one I tried earlier this year at Miramonti L’Altro in Concesio, but Al Gambero’s version came very close. Rich, luscious and creamy, the risotto went down effortlessly, slowly revealing complex and concentrated asparagus, cream and herb flavors. 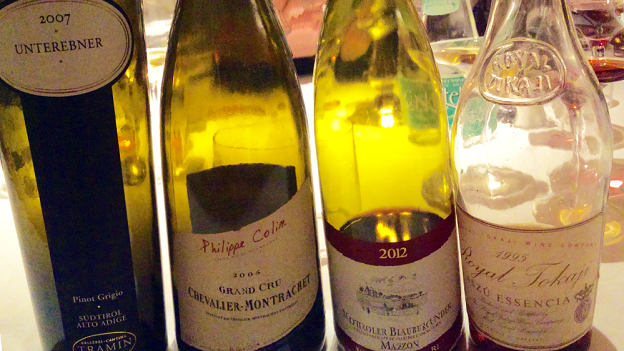 I thought that Philippe Colin’s 2005 Chevalier-Montrachet would be rich and big enough to stand up to the creamy risotto, and it was. Unfortunately, at ten years and counting, this white Burgundy is still very much a baby, and oaky aromas and flavors that are still too dominant. Nevertheless, the 2005 Chevalier is beautifully concentrated and pure, and so I hold out hope. I wouldn’t touch a bottle for another four to five years, and by then, hopefully, the oak will have mellowed out a bit allowing the fruit to shine more. It’s hard to do better than Pinot Nero with roast kid, so choosing the 2012 Gottardi Blauburgunder Mazzon was a no-brainer. Easily Italy’s best Pinot Nero, this bottle proved fresh and lively, with clean red and dark berry flavors and a complicating flinty quality. Although on the light side, it accompanied the rich leg of kid well, even if a wine with just a little more velvety flesh would have proved a better foil here. As I am a dessert nut, I would normally have one or two to finish my meal, but on this night I decided to go with a glorious wine that is a dessert in and of itself. The Royal Tokajy Wine Company’s 1995 Tokaji Aszú Essencia is a real conversation starter. Thick, rich and extremely intense, this viscous stickie is a truly memorable effort and makes you immediately realize the chasm that exists between any very good 5 or 6 Puttonyo wines and an Aszu Essencia. There is a level of concentration and harmonious acidity that really lifts the super-intense notes of raisins, orange peel, dates, burnt sugar and Islay single malt. Clearly, the 1995 wasn’t inexpensive, but it was reasonably priced on the restaurant’s list certainly worth a splurge. At evening’s end, I walked out of Al Gambero happy and relaxed. The combination of an interesting and fairly priced wine list, great food, friendly, competent service, and good friends to share all this with is what dining memories are made of.